By the third trimester, your baby’s ears are ready to hear! 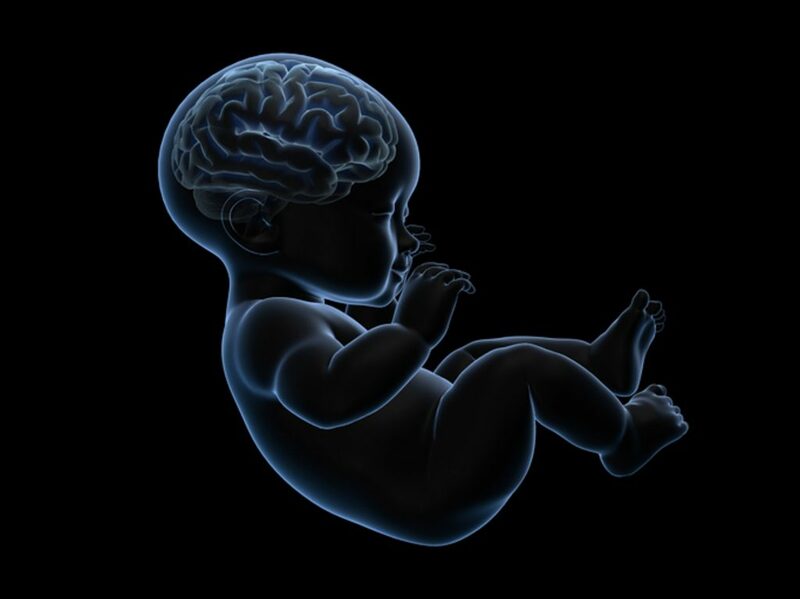 While a baby in utero hears what’s going on outside the womb at about 10 decibels lower than you do, the rhythm, melody, and other language patterns that serve as the foundation of speech are actually crystal clear. Wondering what the world sounds like to your baby? Try placing your hand over your mouth and speak. What you hear is very similar to how your voice sounds in the womb! Additional research suggests that third-trimester babies not only pick up on language patterns, but after birth, they can recognize words they first heard in the womb. Though the extent to which babies in utero can learn has yet to be determined, prenatal reading is nonetheless a wonderful way to kick-start healthy brain development. Taking just a few minutes every day to kick back with a good book is a great way for anyone to relax, and it’s especially helpful for expecting moms. Relaxation activities such as reading aloud are essential to a healthy pregnancy. Studies show that third-trimester babies not only hear but also recognize the sound of their mother’s voice. Mom’s soothing tones cause a baby’s fetal heart rate to lower and can help establish auditory bonds that carry on after birth. Hearing Mom and Dad read solidifies these early bonds, and encouraging family participation helps others connect with the baby. Reading together is one of the best things you can do to help your child grow into a reader and a successful learner. Why not start now? Make reading a habit today, so it will be a part of your tomorrow. Reading to your baby should always be a positive experience. Set a flexible schedule that works for you. Reading as little as 10 minutes every other day can be a great way to reap the relaxation and relationship-building benefits of this activity. What on earth do you read to an unborn baby? Repetitive books with bouncy rhythms and rhymes are great choices for fetal ears. However, the most important thing to remember is to pick books that you love, and that you hope your baby will love, too! Do you have a favorite book that you or your partner read as a child? None are coming to mind? Take a walk through the children’s department of your neighborhood library and see what you remember. If you’re feeling unsure, talk to a librarian for recommendations. Children’s librarians are early literacy experts and will be happy to point you in the direction of some great titles. 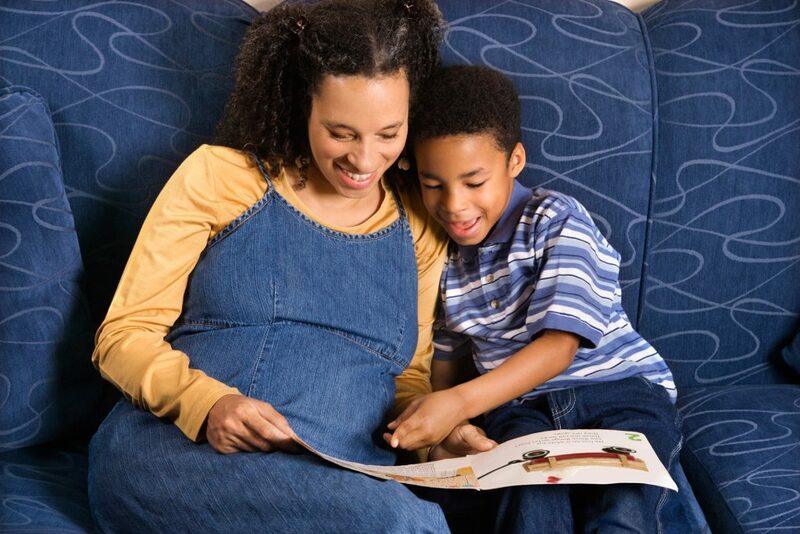 Prenatal reading is a great bonding opportunity not only for moms, but also for a baby’s entire future family. Invite your partner, parents, or any loved ones to read to your baby. Do you have other children? Try asking a big brother or sister to select books to read with their sibling-to-be. Don’t turn up the volume. While you might be tempted to amplify your voice to help baby hear, experts advise skipping the speakers. Too much audio stimulation isn’t good for a baby’s developing brain or sleep cycles. Don’t worry about your voice, mispronounced words, or skipped-over sentences. Your baby isn’t going to judge you, so put your insecurities aside and use reading as a fun bonding activity.